Your camper will complete tons of great building projects with our 3-in-1 All Terrain Robot and the ALL NEW Dodeca 12 in 1 Solar Hydraulic Robot. Campers will also learn to solder when they build the Blinky robot! The 3-in-1 All Terrain Robot is a multi-function tracked mobile robotic kit which utilizes different track modules to make your robot transform into 3 amazing variations: the forklift, rover, and gripper. Using the wired controller, you can command the robot to move forward, backward, turn, grip and lift. In forklift mode, the ATR is like a mini industrial fork lift, with the ability to lift up to 100 g in weight. In rover mode, the ATR’s tank-like treads can traverse any type of surface. And in gripper mode, the ATR’s strong arms grab and lift anything up to 100g, allowing you to move it to your desired location. This kit allows campers to create and recreate: Put it together, take it apart, make another module…It’s all about flexibility, and intelligent thinking. But luckily, kids don’t have to be robotics engineers to create and achieve. With the 3-in-1 All Terrain Robot, they learn as they play. ALL NEW! 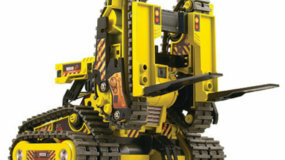 We are excited to introduce the Dodeca 12 in 1 SolarHydraulic Robot. It has a gear box that is a true dual threat as it is powered by direct sunlight, and a hydraulic transmission. With the Dodeca, children are able to actively learn two forms of alternative energy while they create and use their infinite imagination. With alternative energy playing such a pivotal role, there is no better time than now to start children on the path to learning basic concepts behind these technologies. Dodeca has 12 exciting forms that can be separated in two animated building modes: Automotive (Buggy, Obstacle Avoiding Rover, Excavator, Forklift) and Animals (Elephant, Pterosaurs, Monkey, Ostrich, T-Rex, Crocodile, Scorpion, Dog-Walker).